With 150 galleries, Art Paris was fun this year even though you were too often told: “This is an all women show”, a particularly irritating comment as far as I am concerned. Artists are sexless, they are either good or bad. 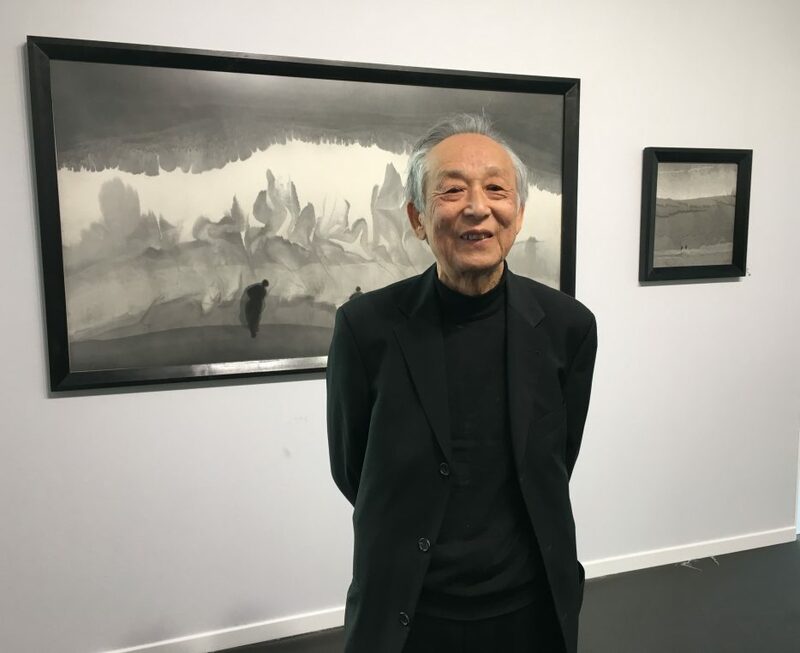 There were two outstanding painters for me, Gao Xingjian at galerie Claude Bernard and Annette Barcelo at Anne de Villepoix, with of course the return of 83 year old Jean Le Gac at galerie Templon and a wonderful Mexican ex-voto painter, Alfred Vilchis Roque at gallery Frédéric Moisan. It was freezing but sunny under the glass roof of Grand Palais and everyone was cheerful and smiling, an exception in Paris these days. Claude Bernard had a huge stand at the entrance with one guest star, Chinese Nobel Prize for litterature Gao Xingjian. He will be exhibited all summer long at Chaumont sur Loire. Guillaume Piens, director of the fair, invited Latino Americans artists this year and they were represented in thirty galleries. 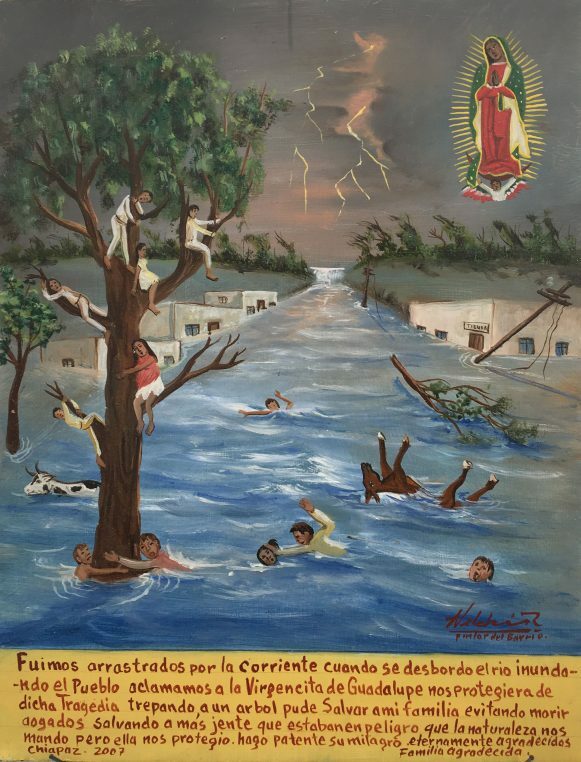 I fell for Alfred Vilchis Roque who works in Mexico and had a whole wall of ex-votos with his son who is keeping up the family work. They describe daily life on the roads and in villages, pains and deaths but also happy moments. At Galerie Templon, where Mathieu Templon is now performing with his father, Jean Le Gac has returned after his successful project at Brasserie Lutetia. Japanese artist Shiaru Chiota was prominently exhibited with a beautiful piece and I learned that her works had sold like pancakes at the Hong Kong art fair. I found with great pleasure, Marinette Cueco’s vegetal sculptures at galerie Univer where she is exhibited until May 25 and encountered a new Japanese artist, Akira Kugimachi at Pierre-Yves Caër Gallery. 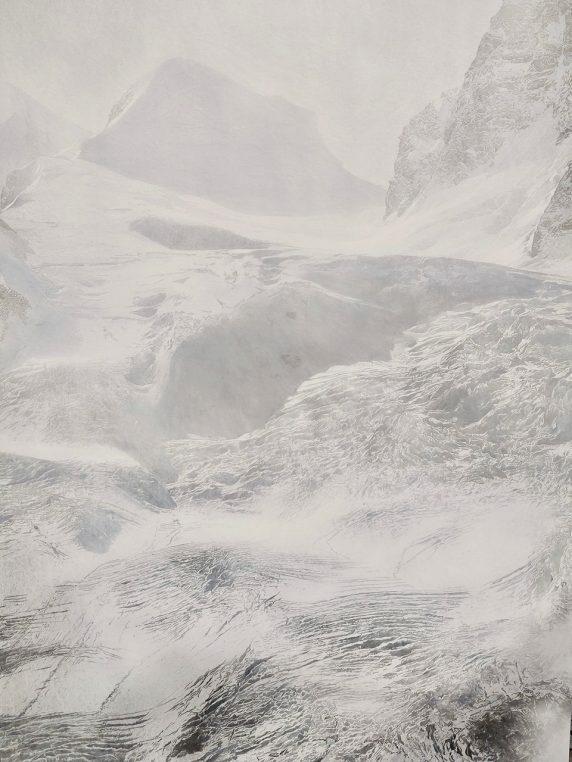 His series “Air” is the result of his crossing of the Alps where moving clouds slowly let the mountain appear. 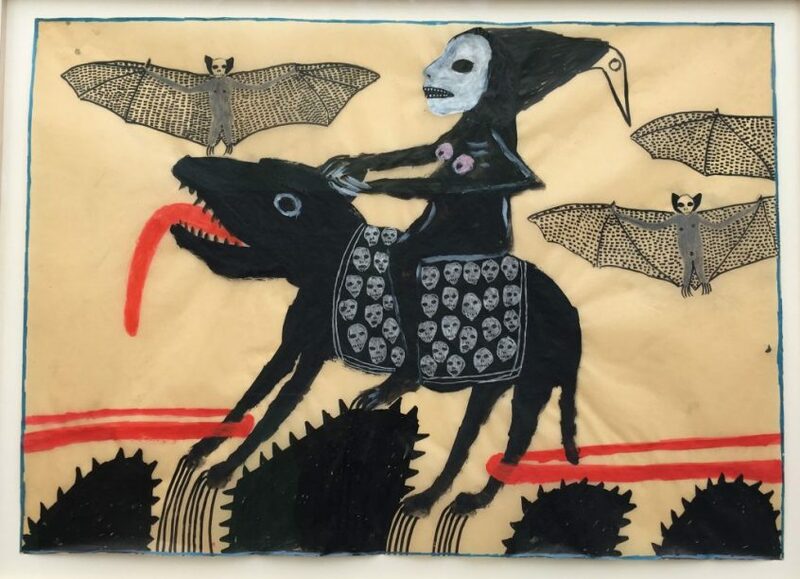 The paintings on paper Kumohada are made with natural pigments being applied on used paper. The effect is very subtle and the reflection of the snow lit by a ray of light through the fog is both soothing and full of anxiety. At Loo &Lou gallery, Flo Arnold is a nomadic artist who exhibits installations made of water repellant Japanese paper on sheathed brass. They are ephemeral and fragile and float in space inviting us to contemplation. 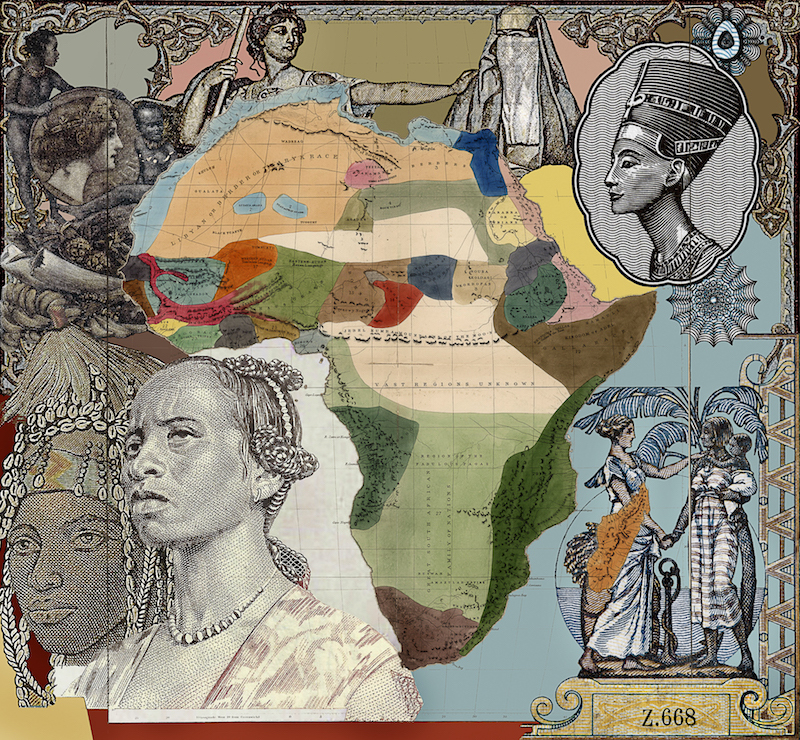 One of the sought after artist from Madagascar, was Malala Andrialavidrazana at Caroline Smulders. The 47 year old artist graduated in Architecture from La Villette university and won the HSBC Prize for photography. The whole space was dedicated to her large historical frescoes. Art Paris was a success because so many paintings were affordable and there was a lack of pretentiousness everywhere. You can follow up on the artists in their galleries all month.